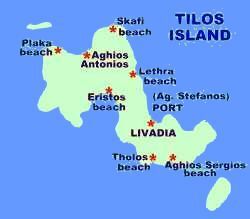 Tilos is located 48 miles southeast from Rhodes in the Aegean Sea. Tilos Island makes for a perfect get away from it all, beautiful beaches, friendly locals and very few tourists make Tilos an island where you can still find the Real Greece. Yet you can still find all the necessaries like restaurants, mini markets, cafes , bakery, as well as car and motor boat rental.